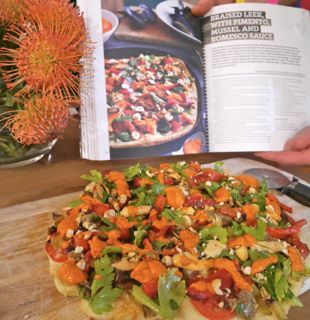 Pizzas are about fun, cheap, humble food that all the family can get involved in making. Yeah Pete, tell that to our 2 metre long supermarket docket. Kylie and Dari: innocent bystanders, managed to survive relatively unstained. Week 3 was a pizza marathon. 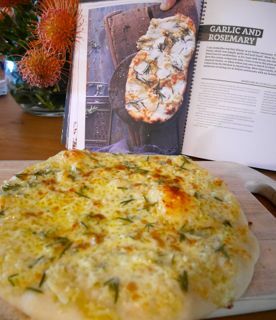 Clare made a rosemary and cheese pizza which was pretty delicious and thankfully pretty quick to make due to Jon's preparation of the garlic confit the night before which left the house smelling like there had been some all out vampire war which we had won. 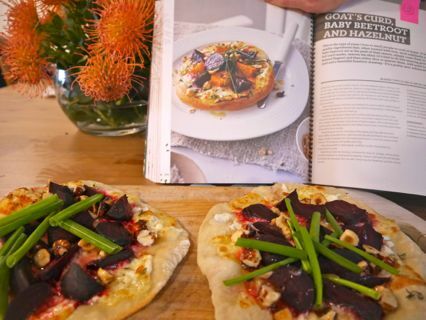 I then made a beetroot and goats cheese pizza - I had to start my own preparations much earlier in the day by roasting the beetroot and reading it stories while stroking it gently in order to loosen up the flavours. Once those processes were done it went fairly smoothly, and the results were also delicious. Jon was making the mother of all pizzas. He started at about 5pm - not counting visiting three shops to source ingredients (mussels were hard to find), and he was finally serving the pizza at around 9pm after a 4 hour mise-en-plus that left romesco sauce on the ceiling and many of the kitchen walls following an incident with the lid of the blender. The kitchen looked like it does in the middle of christmas dinner preparations, and the fridge was full to overflowing with the rest of the ingredients. I'm not sure Pete understands the concept of a quick pizza - the leeks needed 20 minutes of frying, the mussels had to be prepared separately, and at the last minute Jon realised that the capsicums needed to be roasted for 40 minutes before using. It was a gruelling evening. But it did finally end, the results looked impressive, and according to everyone else, quite delicious.